Hey, not everyone wants to be a lord or lady! Our group of peasant outfits are suitable for a re-enactor wishing to portray any number of persons: maid, cook, farm laborer, or dairy maid, just to give you an idea of the possibilities. This cotton chemise has a drawstring neckline and elasticized cuffs. Machine washable, this garment is available in your choice of color to suit your gown. 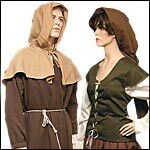 Peasant Man costume includes: A Peasant Shirt, a Tunic with tie at neck, Long Pants with elastic waist for ease of fit, a Rope Belt, and a Hood with cape (can be hemmed or un-hemmed and ready to fringe). Male Peasant Outfit includes: A SHIRT, a TUNIC with tie at neck, calf-length PANTS and a HAT that conforms to the head to keep all that dust & dirt from the stables out of the hair. Our Dairy Maid Outfit would be great for those hot summer days. Includes 4 pieces: Shirt, Mid calf length skirt, apron with a patch, Scarf to tie around the hair, usually pinned at the back of the neck. Our Peasant Hat is made of wool with a cotton liner for comfort. Our Peasant Lass Outfit includes 4 pieces: Under-dress, Skirt with drawstring waist can be cinched up on one side to show more of the under-dress. Hip length Bodice with sleeve caps in twill or poplin. Head wrap of poly cotton. Peasant Outfit also doubles as a Medieval Foot Soldier. Great for LARP, Stage, Film and Faire!